Michael Gabriel, with his band Urban Trash Vibrations, releases his debut CD on the small independent label Vervetone Records, and after Lex told me he really didn't like this album, I had to give it a go, knowing our fundamental differences when it comes to music. Already the opener Modern Living (which you can download on the artist's website) gives you great first impression, owing as much to the strawberry weirdness of late Beatles as to the more contemporary britpop followers. Gabriel's slightly drawled vocals remind me of a light version of Bob Dylan. 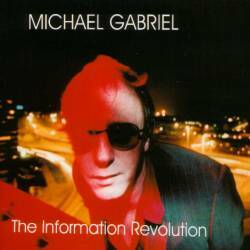 The songs on The Information Revolution always work best when they are treading on ballad territory, like Pray and Don't. The only thing, apart from the short running time of little more than half an hour, that I don't like is the rather synthetic sounding drum sound, stripping parts of the music of its warm organic quality. Still you get a surprisingly pleasing album from an artist who is still so low-key that neither his homepage nor his label's reveal much information about him. All those into the retro sounds of the British Isles won't regret checking out Michael Gabriel.